Firstly, I want to say a big thank you to my beautiful little sister, Chloe for being a model for my blog. I wanted to create a very subtle prom look using only the Urban Decay Naked Palette on the eyes. I thought since my sister was quite a bit younger than myself, I would go for something quite minimal. I tend to wear quite heavy eye looks for events so I thought creating this look would be perfect for those of you attending prom or any event and don't like wearing too much makeup. This is such an easily created look and I think it suits most skin tones. To prime the eyes, I used the Urban Decay Primer Potion because I feel that this eye primer really prolongs the length of time your eyeshadow stays in place. It is so important to use a primer before you apply any eyeshadow when you have an event like prom which can last the entire evening. My sister has very blue eyes and I always think that gold tones compliments blue eyes. I decided to take half baked from the UD naked palette, all over the mobile eyelid. I then took Buck, which is a lovely matte brown shade through the crease of her eye to add some definition into the contours of the eye. This ensures her crease is more prominent and defined. To deepen the outer V of Chloe's eyes, I used Darkhorse, which is a deeper brown shade with a green undertone which contains golden reflexes. This shade is perfect because it deepens the outer V creating that soft but smokey look. I decided against using a matte black shade because I wanted this look to be more natural especially for those who prefer to wear less makeup. To highlight the inner corners of the eyes, I used the shade Virgin. This is a gorgeous pearly pink toned white which brightens and lifts the eyes. I then used Buck and Darkhorse to smoke out the lower lash line instead of using a kohl eyeliner in the waterline. 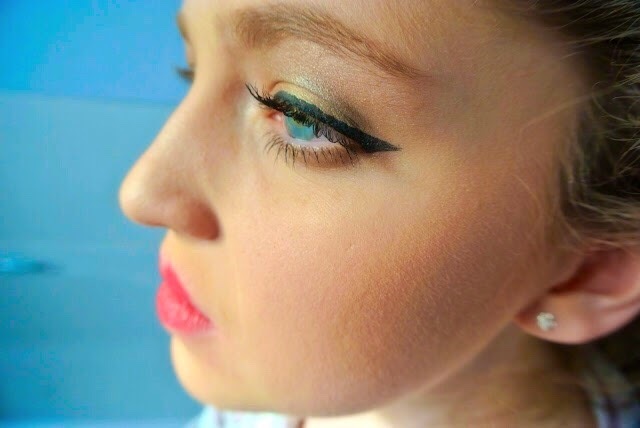 For Chloe's winged eyeliner I used The Balm's Schwing eyeliner. 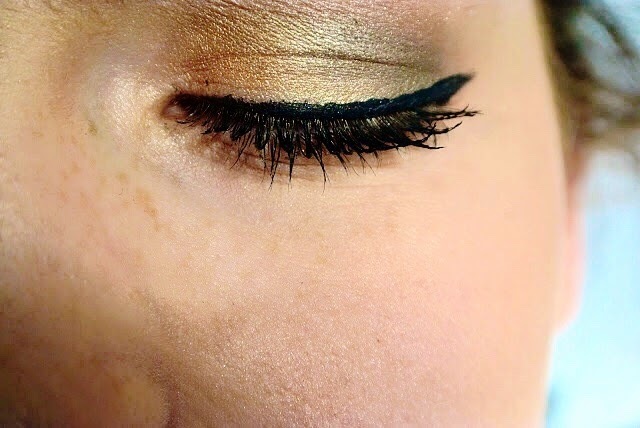 This eyeliner is perfect and opaque so creates a slightly more dramatic edge to the look. 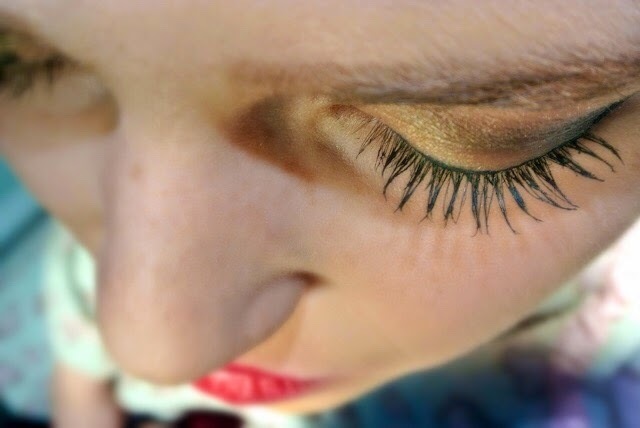 Again, I decided to avoid using fake eyelashes because I wanted this to be more subtle, so I used a few coats of the Max Factor Masterpiece Transform Mascara. This mascara is my holy grail, it provides great length and volume and creates the illusion of a false lash effect. For Chloe's base makeup I used the Mac Prep and Prime Fix + to prime and refresh the face and then I applied the Mac Studio Fix Fluid Foundation. To brighten and conceal I used the Maybelline Instant eye eraser concealer and the Benefit Erase Paste. I set the under eye area and highlighted areas with the Ben Nye Banana powder. To contour I used the Anastasia Beverly Hills Contour kit. I then applied the Burberry Light glow misty blusher to apply a soft and warm glow to her skin. To complete the look I used the Rimmel Apocalips lipgloss in the shade stellar. I then set the makeup look using the Urban Decay All nighter Setting spray to ensure Chloe's makeup would last the whole night. Both myself and Chloe were happy with the outcome of this look. It creates a very natural but put together makeup look which is perfect for those who would prefer not to have a dark smokey eye look for prom. I hope this was of help to some of you. If you would like to see more makeup looks please let me know in the comments section below because I love doing these sorts of posts. I also want to say thank you all for your continuous support, I love reading all your emails that you send me, they make me smile so much. 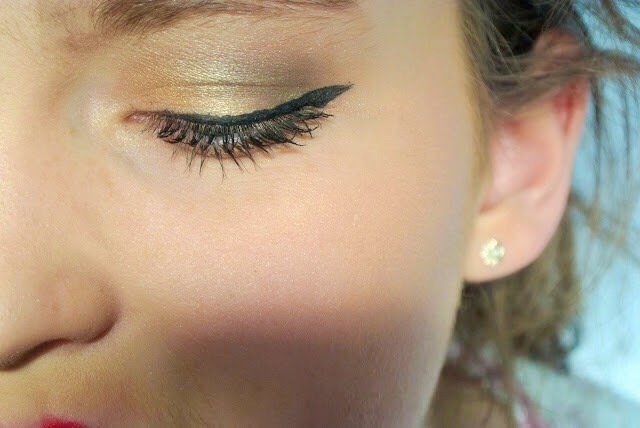 This makeup looks so lovely on your sister, I wish I could do eyeliner like that it looks flawless!